Nintendo's Reggie Fils-Aime doesn't think virtual reality products such as the Oculus Rift are ready to hit the market. Lots of people are getting pretty excited over Oculus's fast approaching Rift virtual reality headset, but Nintendo of American president Reggie Fils-Aime unfortunately isn't one of them. Fils-Aime says he can see the potential of VR, but doesn't think it's quite ready yet. He says that when it is ready, Nintendo will definitely be on board. "For us, it's all about fun gameplay," Fils-Aime said at E3 according to the Associated Press. "That's what we want. We want a fun, compelling experience. Right now, the technology isn't quite there yet, in our view." 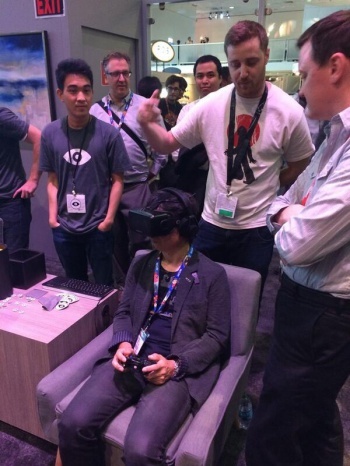 Nintendo's own Shigeru Miyamoto was spotted trying out the Rift demo unit at this past E3, as you can see in the image to the right. Fils-Aime went on to add that "Certainly, [VR is] something we're looking at," stating "We look at a wide range of technologies. When it's there and enables a fun experience, we'll be there, too." So, it looks as if Nintendo is going with the "wait-and-see" approach to VR, rather than diving in with its own competition. Another reason Nintendo may not be too keen to jump into VR is the catastrophic failure that was the Virtual Boy. If any product was released with technology that "wasn't quite there yet," it was the Virtual Boy, so you can understand why Nintendo is playing this one a bit more cautiously. Sony, meanwhile, is hard at work on its own virtual reality headset: Project Morpheus, while Microsoft has yet to weigh in with any sort of VR product.